Yesterday evening I attended the ‘Gita Wisdom’ class at Jivamukti Yoga, near Union Square. It has been running for about five years now, and is taught by Joshua Greene (Yogesvara das), a seasoned bhakti yogi and dedicated student of the Bhagavad Gita.The class takes place in one of the large, bright studios and hosts a sincere group of spiritual seekers from different walks of life. Many are yoga teachers, eager to integrate these spiritual teachings into their physical asana practice and pass this on to their own students. Last night was the final class for the chapter by chapter study that has run for the past few months. It started out with a few minutes of simple Hare Krishna kirtan that set a meditative mood. All of the thirty-odd students sat on the floor, unpacking notebooks and pens, and well-thumbed copies of the Gita. Joshua began the summary of the final eighteenth chapter by talking about the character of Vidura. I loved the way he brought the characters to life. I think one of the most important things about studying any scripture is to understand its reality – these characters are not mythological – they were real, living breathing, thinking, feeling, and their struggles, lessons and successes can be directly applied to our own lives if we perceive them in this way. I’m always amazed at how lessons from the Gita that I’ve heard hundreds of times growing up can strike me with a shocking freshness, again and again. 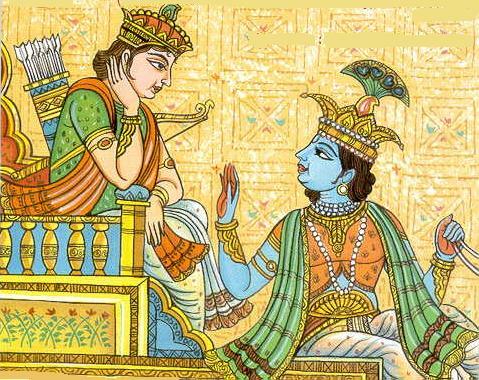 When Joshua explained that spiritual life is experienced in progressive stages, and that what Krishna tells Arjuna at the very end: ‘Fully surrender unto me’, couldn’t have been spoken at the beginning without being preceded by deep explanation, I thought deeply about my own spiritual progress. I often give myself a hard time for not doing better; not getting up early without fail every day; for not being more disciplined and regulated; for my moments of ‘weakness’ when I just long for home comforts, or turn a blind eye to my responsibilities. The truth is, we are all struggling somehow on individual journeys. Just as Arjuna’s dilemma is not an allegory, but very real, our daily choices and activities present so many real, sometimes frightening challenges. It’s tempting to think that there must be a way of side stepping. Perhaps by choosing a ‘spiritual life’ we can just be peaceful and avoid the inner battle. But these things have to be faced as a part of our path to remembering who we really are, a blissful soul in an eternal, loving relationship with God. With challenges come realisation and increased opportunity to depend on God in humble, loving surrender. Every morning I wake up here in New York and have a ‘What am I doing here?’ moment. It’s scary to not have the full picture. It’s humbling to realise how small I am in this sprawling, frantic city. But I am so thankful that I have the Gita to help me remember that this time is a gift from Krishna. These challenges are a vital part of the big picture. Check out the Gita Wisdom facebook page, for photos, recipes and links to watch the class live each week. Summer is a cumin seed! Flowers of India – so cool!